When the Makers Lab opened in April 2016, we were eager to explore 3D printing applications for UCSF. We soon learned there are countless applications for this technology at a health science institution. 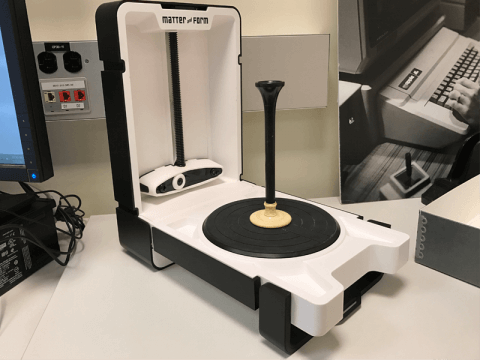 Even better, there are some incredible applications for us right here in the UCSF Library, specifically for the Library’s Archives and Special Collections department and the Makers Lab. Connecting the new with the old may not immediately appear to be a great partnership, but we quickly learned otherwise. After holding a short welcome session for Archives staff in the Makers Lab, I soon found my way on a tour of the UCSF Archives vault. This was my first time touring the vault and I marveled at the incredible collection that has been curated by the Archives department over the years. 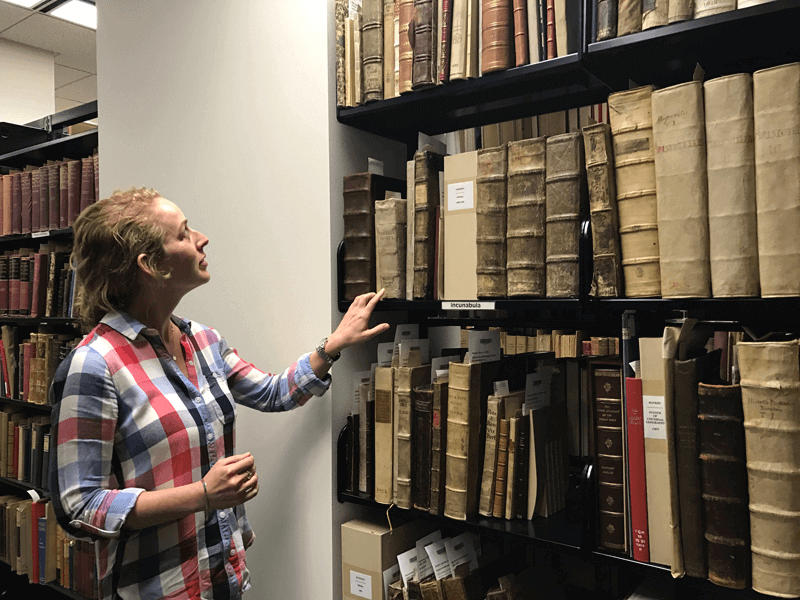 I teamed up with Project Archivist (and Makers Lab volunteer) Kelsi Evans and began to search through the inventory of health science artifacts housed in the Archives. While reviewing the spreadsheet of over 900 items, Kelsi and I continued to find artifact after artifact that we knew had the potential to be recreated in the Makers Lab. Why recreate medical artifacts? Because many of these items are rare, old, and delicate, and must stay behind glass or be closely monitored in the Archives reading room. Why not recreate these artifacts to allow patrons to touch, feel, and interact with the material? Unlocking the collection was our goal for the proof of concept project. 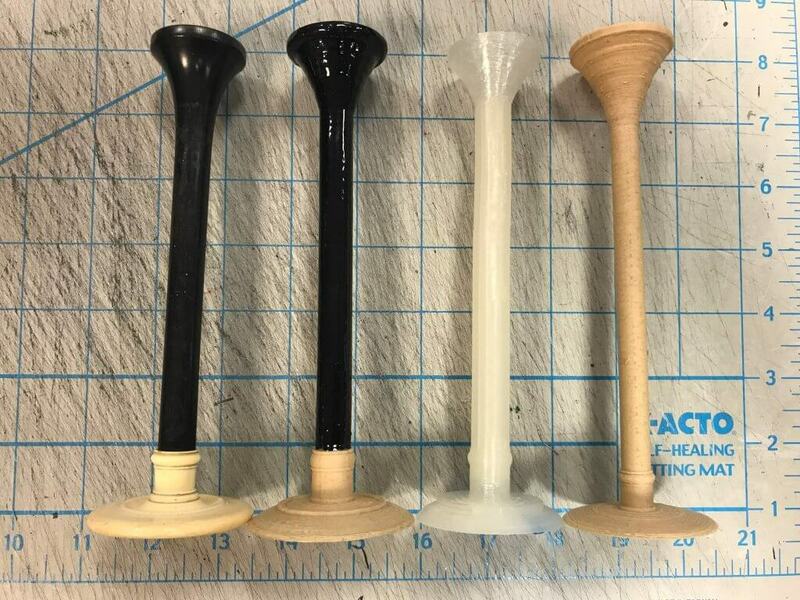 Kelsi and I selected a stethoscope from the 1850’s, made of ebony and bone (see image below). The stethoscope is a great example of a piece that most often cannot be touched by patrons and must be displayed behind glass when part of an exhibit. What if we could unlock this piece from the collection and get it into the hands of patrons, allowing them to use the stethoscope like a doctor or nurse may have in the mid 1800’s? Archives and Special Collections was kind enough to loan the stethoscope to the Makers Lab for the project and I got right to work digitizing the instrument. 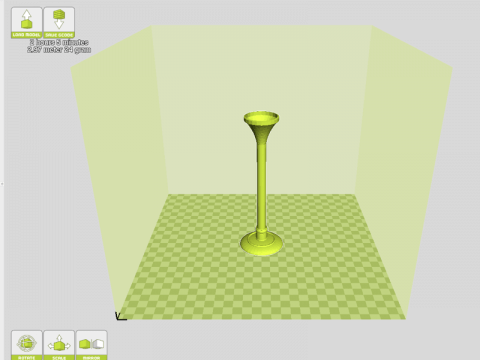 I began by 3D scanning the stethoscope using the Matter and Form 3D scanner in the Makers Lab. As you can see in the picture of the original stethoscope, the top potion is black, which unfortunately does not scan well with the 3D scanner. Not a problem, I moved on to modeling the stethoscope using the free, web-based software, Tinkercad. I spent the large majority of my time working in Tinkercad, trying to get the 3D model just right. There is still room for improvement, but the model you see below was good enough for our proof of concept and I was ready to 3D print. 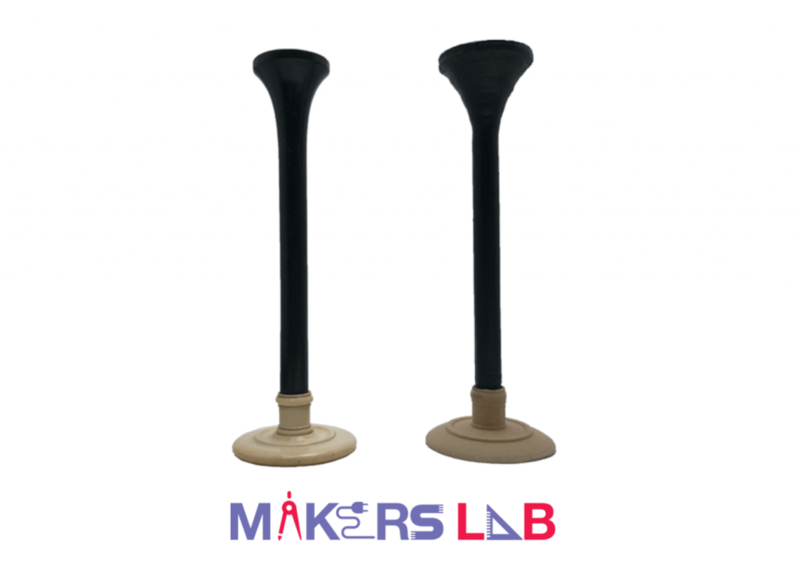 I selected the colorFabb woodfill filament for the 3D printing material, which had a similar look to the bone that is used in the base of the original stethoscope. I used the LulzBot Taz 5 3D printer to manufacture the stethoscope, which took 90 minutes to print. 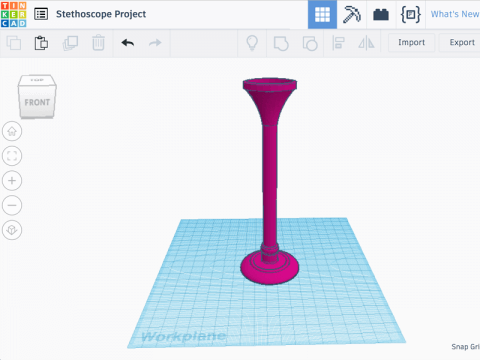 As you can see in the picture below, I printed the stethoscope a number of times and would go back and adjust the 3D model in Tinkercad until I was satisfied with the final result. Click to watch the full time-lapse video of the 3D print. Next, it was time to finish the print, which involved sanding the wood model to smooth the surface before painting. I then prepped the stethoscope using tape and painted the top potion black to resemble the ebony. I initially applied a coat of resin over the black paint to give the stethoscope the gloss we see in the original piece. I eventually decided against using the resin because the black paint alone was closer to the look of the original stethoscope. And below is the 3D printed proof of concept next to the original stethoscope. 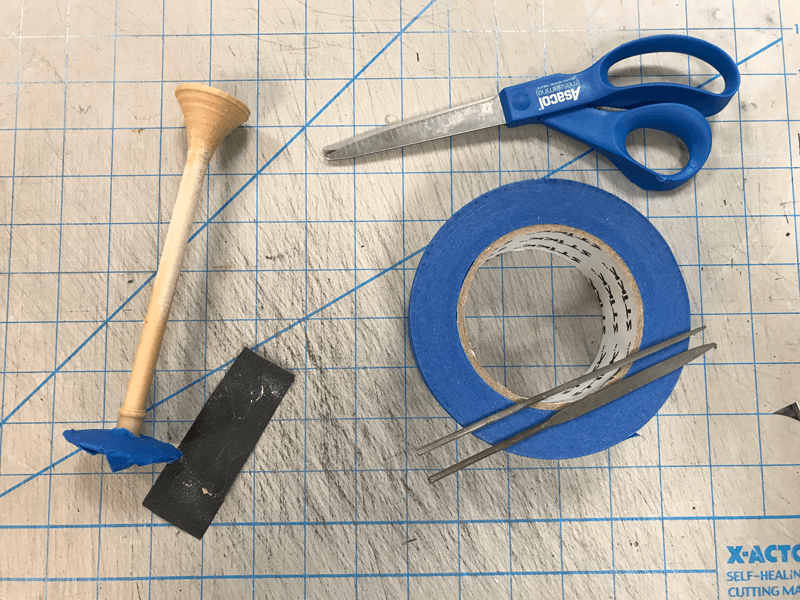 The total cost in materials is under $2 ($1.84 to be exact) to manufacture one stethoscope in the UCSF Library. It was a great day when I delivered the stethoscope to the UCSF Archivists, and it was even better to hear their feedback and thoughts on the proof of concept. As I mentioned before, there is room for improvement with the final model, but through this project we were able to confirm that we have many of the tools and technology needed to help unlock the UCSF collection. Kelsi and I can now go back to that spreadsheet of over 900 items from the vault and can begin to prioritize upcoming projects. There are countless opportunities for recreating UCSF archived materials for events, exhibits, donor visits, and more. I can imagine holding Library events where patrons are able to bring home a reproduction of UCSF’s history as a gift or door prize. Throughout the proof of concept project we also explored other collaboration opportunities for Archives and Special Collections and the Makers Lab. While these events took on a more creative tone, they were also successful in getting UCSF archived materials into the hands of patrons who otherwise may not be familiar with that portion of UCSF’s history. We look forward to working with Archives and Special Collections to continue to help unlock the UCSF collection and uncover new applications for making in the health sciences. The Makers Lab would like to thank Polina Ilieva, Kelsi Evans, and the rest of the Archives and Special Collections team for their willingness to open the vault and discover new ways to engage with our community. We cannot wait to see what will be created next! Want to recreate your own piece of UCSF history or even prototype a new medical instrument? Visit the Makers Lab website to get started.